LongAmp® Hot Start Taq 2X Master Mix offers exceptional performance with long amplicons. LongAmp Hot Start Taq 2X Master Mix contains a unique blend of aptamer-based Hot Start Taq and Deep VentR™ DNA Polymerases. The aptamer-based inhibitor binds reversibly to the enzyme, inhibiting polymerase activity at temperatures below 45°C, but releases the enzyme during normal PCR cycling conditions. This permits assembly of PCR reactions at room temperature. The LongAmp® Hot Start Taq 2X Master Mix does not require a separate high temperature incubation step to activate the enzyme. The 3´→5´ exonuclease activity of Deep VentR DNA Polymerase increases the fidelity and robust amplification of Hot Start Taq DNA Polymerase (1). LongAmp® Hot Start Taq DNA Polymerase offers two-fold higher fidelity than Hot Start Taq DNA Polymerase alone. The convenient master mix formulation is supplied at a 2X concentration and contains dNTPs and Mg++, requiring only the addition of primers and DNA template for robust amplification. A wide range of PCR products can be generated; up to 30 kb from lambda or human genomic DNA. Amplification of a 8 kb amplicon from varying amounts of Jurkat genomic DNA using LongAmp Hot Start Taq 2X Master Mix. Starting template amounts are indicated below the gel. Marker M is the NEB 2-Log DNA Ladder (NEB #N3200 ). 1X ThermoPol™ Reaction Buffer, 200 µM dNTPs including [3H]-dTTP and 200 µg/ml activated Calf Thymus DNA. Product specifications for individual components in the LongAmp Hot Start Taq 2X Master Mix are available separately. Barnes, W.M. (1994). Proc. Natl. Acad. Sci. USA. 91, 1350-1354. Powell, L.M. et al (1987). Cell. 50, 831-840. What is the fidelity of the LongAmp™ Hot Start Taq 2X Master Mix compared to Taq DNA Polymerase? Can the extension step be carried out at 72°C when using LongAmp™ Hot Start Taq 2X Master Mix? What is the extension rate when using LongAmp™ Hot Start Taq 2X Master Mix? 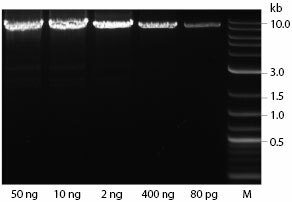 What type of DNA ends result from a primer extension reaction or a PCR using LongAmp™ Hot Start Taq 2X Master Mix? Can LongAmp™ Hot Start Taq 2X Master Mix be used to amplify GC-rich amplicons? Using an extension temperature of 65°C is recommended in LongAmp Hot Start Taq reactions. Nucleic acid-based aptamers for use with thermophilic DNA polymerases are licensed exclusively by New England Biolabs, Inc. from SomaLogic, Inc. (See Patent Nos. 5,475,096; 5,670,637; 5,696,249 5,874,557; and 5,693,502). New England Biolabs, Inc. gives the Buyer/User a non-exclusive license to use the aptamer-based LongAmp Hot Start Taq 2X Master Mix for RESEARCH PURPOSES ONLY. Commercial use of the aptamer-based LongAmp Hot Start 2X Master Mix requires a license from New England Biolabs, Inc. Please contact [email protected] for more information.